With jalada Just Translate the world speaks one language - Yours! jalada Just Translate provides instant full text translations between dozens of different languages. It can translate words, sentences, emails, tweets, web pages and more between any combination of the supported languages. This makes information universally accessible and useful, regardless of the language in which it's written, and helps you to connect with others faster than ever. Designed for everyday personal and office use, jalada Just Translate makes communicating in multiple languages a snap. Simply type your text in the appropriate field to translate instantly. 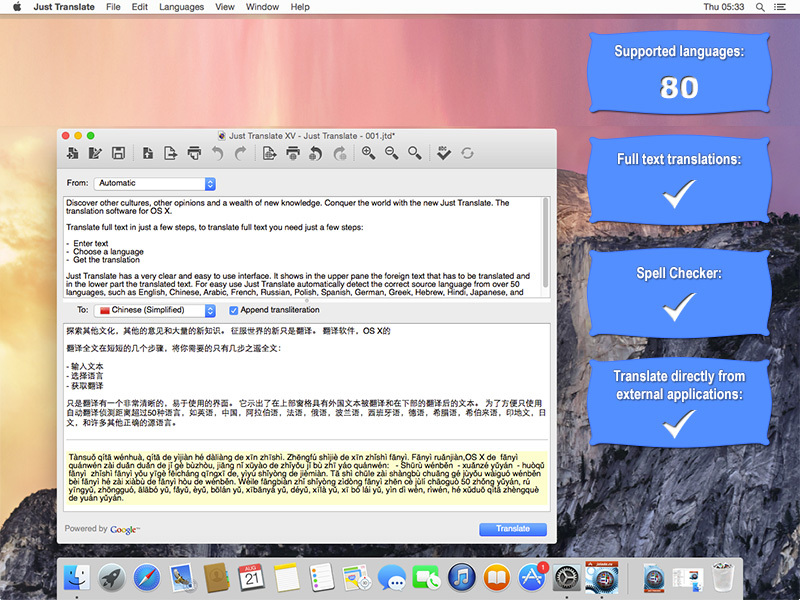 Easily check mistranslations with the integrated spell checker. And save and reuse previous translations for future use.